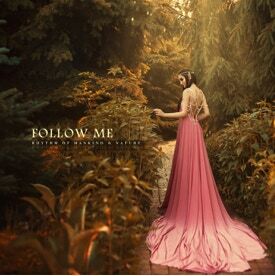 A mild, delicate, relaxing album “Follow Me” by “Rhythm of Mankind and Nature” project. An unconventional approach of the producer to creating an album makes a music capable of capturing your imagination. For 50 minutes, with smooth transitions from one composition to another, a mysterious, inexplicable World is forming in your consciousness. The producer’s natural gift of being able to set up atmospheric, musical Worlds attracts listeners throughout the World. A special, unique combination of sounds and rhythms, the workmanlike, inimitable sleeve artwork make the album stand out from similar musical styles. A new, voluminal sounding, harmonic combination of melodies signify a professional approach of the maker of the project to atmospheric genres. A delicate, complex, and meticulous work of the sound engineer helps create a required depth and clearance of every sound in the music picture. Listening the album “Follow Me”, one gets an impression that the producer knows the secrets of the effects sound makes on man. All who heard the recording will say that it opened in them something inexplicable and new. Wish pleasant listening to you. P.S. I remember how two weeks before his death we were silently laying together, and Matvei suddenly said firmly, “I will never leave you.” This promise became a really invaluable power source for my further creative work on the Earth. Through pain and grief I gained the experience which didn&apos;t destroy but strengthened everything I appreciate in my life: creation, relationship, love to the Universe, love to people, nature, music. With his sad heart, worriedly and unwillingly passing away, he was gradually losing physical link with the family and friends, but at the same time gaining wisdom and maturing. Almost all compositions in the album were written in hospital, near Matvei. During the day I helped him to take medical treatment, at night I was thinking and writing music, keeping an eye on him sleeping. I tried to stay near him as often as possible as if feeling that our time was very limited. Now I thank my starts for help to hold the memory of my son, the memory of fight against his disease, of fight against my fears. All this is reflected in the music of the ‘Gravity’ album. Now I am one of thousands those who lost their child because of this horrible dreadful disease. The fight for life of our seven-year-old son Matvei, who was taken ill with a leukosis in September, 2016 and died in October, 2017, became such a difficulty. That year was very heavy, with fear, hope, joy, disappointment, pain, grief, life and death thoughts, thoughts of God. We sew the little boy overcoming obstacles step by step, courageously and heroically, but going to inevitable death and accepting his fate.